Design Illusions provides professional artistic services to homeowners, designers and private business. Bringing excitement and sophistication into your life through the merging of Fine Art and Interior Design, Linda introduces a breathtaking alternative for your living space. 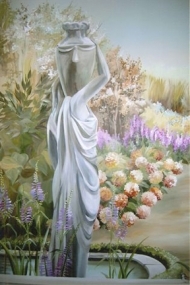 On canvas, walls or furniture, the world of art and illusion can be manipulated to create dramatic or subtle originals. Using the timeless techniques of old world artisans, Linda begins with sketches and sample boards based on your inspiration and influences. She will assess your interior style and colour scheme ensuring continuity. From classical paintings and sculpture to post-modern visual representation, in oil or acrylic, an original concept can be transferred to the decorating medium of choice. This truly artistic expression will add a new vitality to any area of your home.